Vivo Pro Kabaddi 2019 is expected to be a bigger event than the previous seasons with more money spent by the teams and the expanding reach of the game. 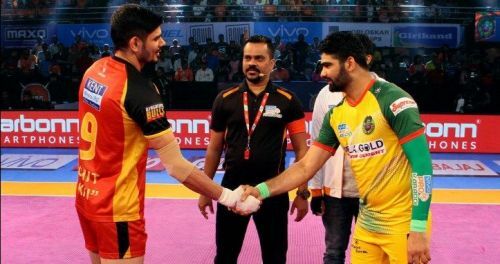 The auction held many surprises for fans as Rahul Chaudhari and Ajay Thakur will play for the same team while Siddharth Desai fetched a huge amount of ₹1.45 Crore from the Telugu Titans. Teams made it clear at the auction, whether they wanted their side to revolve around their raiders or defenders. Though the part of the defenders in the team is increasing, it was still the raiders who hogged the limelight during the auction. Season 7 of the Pro Kabaddi League is set to commence from July 18 and the teams will want to get their team combinations right. On that note, let's take a look at which team has the strongest raiders and rank the raiders of the 12 teams. U Mumba are the weaklings when it comes to the raiding department this season. They have no known player in their department and lack a driving force in their side. They lack a player who can consistently score 9-10 points in every game and though there a couple of good supporting raiders in their side, none of them seem to be good enough to take on the lead role. Rohit Baliyan and Athul MS are expected to lead the side's charge while Abhishek Singh will be a good support. Dong Geon Lee and Arjun Deshwal will be good substitute options for the side. Sandeep Narwal, their prized all-rounder who they signed at the auction can raid during pressure situations but all in all, U Mumba don't have such a formidable raiding unit. The Gujarat Fortune Giants have made it clear that their team revolves around their defense and naturally, their raiding unit isn't too flashy but it has consistent raiders who have done a decent job so far. Young Sachin Tanwar will be the side's lead raider and has impressed at a very young age playing for the side. He scored a total of 204 points last season and can score points at an impressive rate. The other raiders aren't as good and will be used sparingly by the side. More GB, who played for Puneri Paltan last season is a smart raider while Abolfazl Maghsoudlou and Gurvinder Singh are handy raiders as well. Gujarat don't have any star raider and though they're effective, their side is based on their defense and don't have too much of a raiding powerhouse.